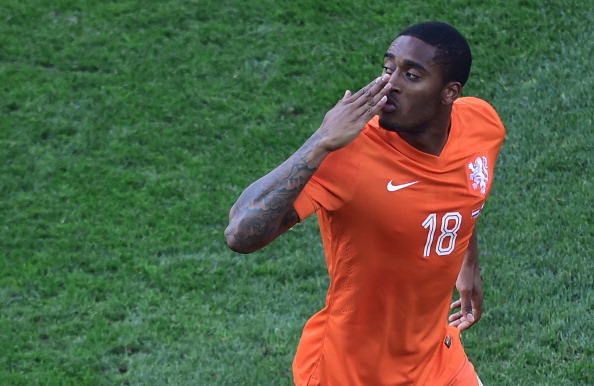 Photo of Netherlands' midfielder Leroy Fer celebrating after scoring during a Group B football match between Netherlands and Chile in Brazil. Videos of Netherland’s Leroy Fer dancing at his wedding with his new wife Xenia Schipaanboord has been surfacing all over the Internet, and even though Fer’s dancing skills are actually pretty impressive, the song the couple was dancing to wasn’t really the most appropriate song, at least not what you would play at your own wedding as you dance with your wife. Fer married his longtime girlfriend Xenia Schipaanboord this weekend, and he can be seen showing off his dancing skills in front of friends and family. The song that was used for their dance routine was Chris Brown's hit song Loyal which emphasises on the line:These H*es Aren't Loyal.